Minimum Sheet Size:8.5" x 11"
Whether you own one of today’s digital color printers or a small offset press, you’re well aware of the growing demand for short-run printing. You probably also see the value that lamination can bring to many of the print applications you’re running. Since the durability and longevity of color output is limited without some sort of protection, the demand for lamination is growing. Two-sided lamination is the ultimate print protector, yet some applications benefit greatly from laminating only one side of a print, applications like covers for books and manuals, folders, sheeted gift and business cards and postcards. One-sided lamination protects and enhances the printed side while keeping finishing costs down. Now, there’s a great new way to capitalize on one-sided finishing that will increase both productivity and profits, whether you have electro-photographic or offset prints. Meet the GBC 620os On-Demand One-Sided Laminating System. This semi-automatic system was made to economically finish prints and grow your profits. The 620OS not only protects dust jackets and covers from wear and tear, it beautifully enhances graphic images. See how lamination increases the perceived value of printed materials. You can create these same applications in your shop. The beauty of the 620 is that it will raise the revenue generated by your digital color printer or press but requires a smaller investment than a fully automated system. Just wait until you see how easy it is to integrate the 620 into your workflow. The 620 is a three-in-one system made up of a semi-automatic feeder, a one-sided roll laminator and a sheet separator with stacker tray. From feeder to stacker and all points along the way, the seamless operation of the 620 enhances the output of a single operator. The three main components of the system are fully integrated into one unit, assuring accurate sheet alignment throughout the job. The 620 is easy to use. Once set up, the operator simply feeds the prints. Laminating, stacking and counting finished sheets are all done by the system. Using the conveniently located panel and LCD display, the operator sets up job requirements and controls all operational parameters. The LCD also displays the current job sheet count along with the machine’s status. The print tray can be extended for extra work space. Film is loaded quickly by simply opening the side bracket of the stationary arm and sliding the roll onto the core adaptors. Once the film is threaded, you’re ready to begin feeding your job into the machine. The feeder uses a unique belt and gating system for accuracy. Two centering scales take the guesswork out of documented film positioning for proper alignment. A third scale is conveniently located for measuring the length of the sheet you’re running. Now, simply dial in the sheet length and align the prints along the side guides of the belt assembly. The synchronized feed gate drives the sheets into the nip with the proper amount of overlap to maximize film coverage while ensuring proper sheet separation. As each sheet is pulled into the nip, another can be staged. Once it enters the heated nip rollers, the graphic is laminated. The port’s infrared heater distributes heat evenly across the heat roller for consistent lamination, while the Teflon coating decreases the chance of sticking. As the print leaves the nip area, it travels under a four-stair cooling tube and over an adjustable decurling bar. This removes any curl from the heated print and cools it quickly so it will lie flat. Finally, silicone-coated rubber pull rollers bring the cooled prints to the separator. Sheet separation is performed using a combination of film perforation, skew wheel and burst roller. A perf wheel located behind the pull rollers perforates the film for easy separation. A second perf wheel above the film roll is used to ensure the proper separation of stronger substrates, like GBC lay flat film. Next, the skew wheel forms a tent in the web. Then, the pneumatically activated burst roller separates each sheet and drops it neatly onto the output stacker. The stacker is easily adjustable using the movable magnetic guides. For added convenience, the 620 comes with its own locking cabinet for the compressor and film storage. The casters allow you to move the unit out of the way when not in use. The 620 laminator is rugged and productive, laminating at speeds up to 45 feet per minute. 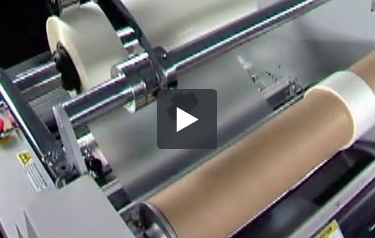 Whatever you’re laminating, your jobs will always run better with GBC films. The 620 will accept a 3,000-foot roll of digital lay flat, polypropylene and polyester film up to 1.7 mils thick and 21 inches wide. GBC digital lay flat film is especially formulated for use with toner-based prints. Its aggressive adhesive delivers virtually peel-proof protection. Narrower films can also be run thanks to easily adjustable core adaptors. The operator can also slip the film to the exact size required for the job by engaging the in-line slitter and letting the rewind take up the excess. This reduces the number of film widths you need to stock. For safe operation, the laminator features a latch-safety shield. The 620 is UL-listed in the US and Canada to meet applicable safety standards. Emergency stops and interlocks are strategically placed throughout the system to ensure safe operation. And, as always, your GBC representative will provide both application and operator training once your 620 laminator is installed. Productivity, profitability, economy and more happy customers – that’s what comes with owning a 620OS One-Sided Laminating System. Let’s look at it again. Set the controls, load the film, stage and feed the prints and let the 620 take care of laminating, separating, stacking and counting your output. You can depend on GBC’s rugged reliability. Backed by the GBC nationwide network of service technicians, it won’t let you down when deadlines are tight. Experience the many sides of this innovative one-sided laminating system – the 620OS One-Sided Laminating System from GBC.